Relationship Monday: Finding Joy in Singleness During Engagement Season. It's been a long time since I've written a Relationship Monday post. When I introduced this on the blog in February, I saw it being a monthly, if not bi-monthly post series! What I quickly learned with the nature of these types of topics though is that you can't force inspiration for writing about things like dating and relationships. The desire to write about this either hits or it doesn't! The last Relationship Monday post that I wrote was in May, and it was one of the most personal posts that I've ever shared on my blog! I guess after sharing all of that I needed some time away from sharing about this subject of relationships. Anyways, today's post topic has been on my heart and mind for quite some time now, and I knew that the timing was right to bring back Relationship Mondays to the blog! Will it become a monthly series again as I intended? I have no idea!! I'm going to keep sharing these posts only as inspiration hits. 😊 But inspiration is definitely hit this month, so let's get into it! Ah, the holiday season. The time for Christmas trees and Christmas music, gift giving and buying, holiday parties, and religious events and services if you celebrate that part of the season. It seems though with each year that I get older, the more and more that I associate November/December with engagements, love, and romance. February and Valentine's Day of course are the official holiday for all things romantic, but seriously, it seems like love it becoming more intertwined with Christmas than its own holiday in the winter! I actually read an article while doing some show prep for one of my radio shows a few weeks ago which had the statistics that each year between 30-45% of engagements happen between Thanksgiving and New Year's Day, so if it feels like everyone on your Facebook or Instagram feed has some shiny new bling on their finger, it might not be a total exaggeration! A little backstory on my own thoughts about engagement: every since I was little, I always thought that I'd be married young. For every part of me that wanted to go to college to study communications and eventually get into the radio industry... I wanted a MRS. degree just as bad! (I kind of hate admitting that publicly- but it's true! Lol.) I didn't really date in high school, and aside from that, I've always been too much of a realist to really believe in most high school relationships working out. So when I was in high school, I always held out relationships-wise for college. A few of my female cousins met their husbands pretty early on in college, and I always just felt like that would be my story as well. College is supposed to be totally different then high school- right? Well, my college years definitely did give me tons of new experiences; a new part of the country to call home, and the first big steps towards working in my dream industry.... but definitely no ring on a certain finger! Heck, I didn't even have a serious boyfriend in college. By about junior year, I really realized that while you can control a lot of things about your college experience, falling in love is not one of those things. I do have friends who met the love of their life in college. In fact- I was a bridesmaid in one of those weddings this past spring! But just because college love stories are the forever stories for a lot of people, doesn't mean it will be everyone's story. That's something I've had to accept and move on from. So here I am, 23 years old, and still currently single. Just like years prior, there is absolutely zero chance of any sort of a ring coming my way this Christmas. Although I am finally at a point in my life where I am happily content as a young single woman (which is a whole separate blog post! ), I will say that thinking about this in detail does bum me out a little bit somewhere inside of me, as 23 is the age that I always wanted to be married at. 1. Remember who you're waiting for: It breaks my heart to know that adults actually get married just for the sake of getting married, and being afraid to be alone. Like, think about it with me for a second... this is an actual thing and not just something in TV shows and movies! Yikessss. I very much do want to get married someday, but because I believe marriage is a God-given covenant, and I want to share that with the love of my life. I don't believe something as sacred as marriage should be shared with any random guy, just because I'm at a point in my life where I feel "lonely." Trust me- I would rather still be single and unmarried at 50 but living a rich and fulfilled life as a single woman, then married to the wrong man just because I settled! If you're not engaged or in a serious dating relationship this holiday season, remember the reasons that you're holding out! YOU are special, and one of God's beloved children. You deserve the love story of your dreams with someone who will be kindhearted, faithful, and making everyday of life together an adventure, and settling for someone random just so you can have a ring on your finger isn't worth it! 2. Consider the expense of a wedding, and how you can spend your money elsewhere: Of course I am super excited to hopefully have the wedding of my dreams someday, but the older that I get, some of the not-so-fun realities about weddings have started to hit me. Namely: how much they cost!!! I think wedding prices keep going up and up every year, and truly, it's an insane industry. Of course a couple wants the day that they've dreamed about, and many couples want a big enough party to include all of their family and friends, but that plus a honeymoon and all the additional expenses equal thousands and thousands of dollars. Personally- I'm choosing to be THANKFUL that it ended up being while I'm in my young 20s and working in radio (a field notorious for low starting salaries) that I don't have to worry about wedding expenses. Instead I can focus during these next few years on paying off school loans (not super fun), but also save for more fun things, like a new car, investments in my blogging business, and my favorite hobby: TRAVEL! 3. Remember marriage statistics: Not to be a downer, but Americans these days don't have great statistics when it comes to marriage success. This comes back again to marrying for the right or wrong reasons. Sure- it might be easy to see jealous in the moment when you see on Facebook that a high school classmate, sorority sister, or co-worker has some new bling on a certain finger during the Christmas season, but think about it realistically. There is a 50% chance that her marriage will not be a lifelong one. There is also a chance that the engagement won't make it to the altar!! Remember that an engagement is a promise- but still not a lifetime commitment. Again- not to sound like a total downer here, but it's important to be realistic about these things, and not idealize too much over other people's circumstances. 4. There's much worse things to deal with at the holidays (or any time of year) than singleness: About to get a little bit blunt with y'all so bare with me here. (And blunt with myself too! I have a feeling I might come back and re-read this post on days that pity parties creep in.) People deal with tragedies all the time- every single day, and at the holidays included. It can be really easy to fall into the trap of wallowing in self-pity and forgetting that this is actually a very minor problem in the scheme of the world, or even just here in the US. There are families who can't afford to provide gifts for their children for Christmas this year. There are people that are homeless this holiday season, without a warm place to sleep at night. There are victims of domestic violence and other types of assault, who live every day in fear and can't enjoy the joy of Christmas. There are the hungry, the terminally ill, the lost and the broken. There's a lot of hurting right now in 2017. When you think about things that way.... not having a fiancé at this stage in your life is a pretty small problem. Try and channel your sad feelings into something nice that you can do to bless others this holiday season instead! 5. 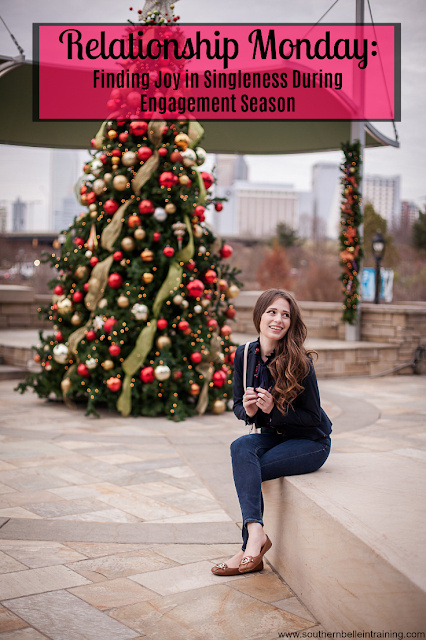 Be the friend to your newly engaged friends that you want them to be to you someday: If you do have a close friend or family member who does get engaged this holiday season, be joyful for them!! Shower them and their fiancé with love, and let them know how honored you are to be in their life during this season for them. Someday it will be your turn, whether at Christmas or another time of year. I'm sure when that time comes for you, you'd much rather have supportive friends and family instead of a jealous and petty bunch of single people who don't care to share in your happiness. 6. Focus on starting your OWN holiday traditions: Growing up, I always was so excited to dream about my future husband and us starting our own Christmas traditions together. Last year was my first Christmas out of college and living in my own apartment, and I realized around Thanksgiving that there is no rule anywhere in the world saying that an adult has to be married and starting a family to create holiday traditions! I started a few of my own last year, at the ripe old age of 22, and it's been fun to bring those back this year, where I'm living in a new state. I also started a couple new ones this year! There you go- a few ideas and thoughts regarding singleness during the holiday season! I hope you enjoyed today's Relationship Monday post. I'd love to hear your thoughts on it in the comments! Great post, friend! It definitely is "easier" to feel alone this time of year, but is so important to remember all the blessings we have and also why we've chosen to not settle. I thought I was going to marry young too. I'm turning 28 on Friday, and I always thought that I would be married by the time I turned 26. Thinking about that now makes me cringe because mentally, I know I was not ready for marriage at that age. It's amazing what we think our lives will look like when we're looking at the future. I love your perspective on single-ness during this season. I just had three friends get engaged this past weekend according to FB. Admittedly, I am very much in love, but it was a long, gross and horrible road to get here. I love your perspective here, especially your first point: Remember what you're waiting for. So important! I love this post. Such good advice! I think learning to be comfortable with being alone is so important and really sets you up for healthier relationships in the future. I love how honest this post is and what I used to think when I was single. Such a great post! It's important to reflect on what really matters and you make great points. I love this post girl! I think it so important to realize that the wait is worth it to find the person for you. Such a great way to talk positively about loneliness during the holidays. Girl, I agree with every single one of your points. Love that you are aware of them and loved this post! I think there is so much growth and adventure waiting in a season of singleness! Such a great post! I guess I'm the opposite, because I always assumed I'd be married at 28-ish, but I got married at 23 (almost 24). As tough sometimes as it was being single, it was a good experience because it allowed me to pay off debt, focus on my career, and most importantly, grow in Christ.